Spring is on the way, and so are my hyacinths! I had to pull them up last summer when we planted a Scotch broom into their pot. (we quickly learned that Scotch brooms are not a good choice for a terrace garden.) I had received a gift of hyacinth blooms several Easters ago from my dear friend Miriam. Three stems multiplied into close to 20 over the years. I stored them over the summer in my closet in paper bags punched with little holes. I meant to plant them promptly in the fall, in our window box where the impatiens were growing. Of course I procrastinated, (and the impatiens stayed strong through the warm autumn.) 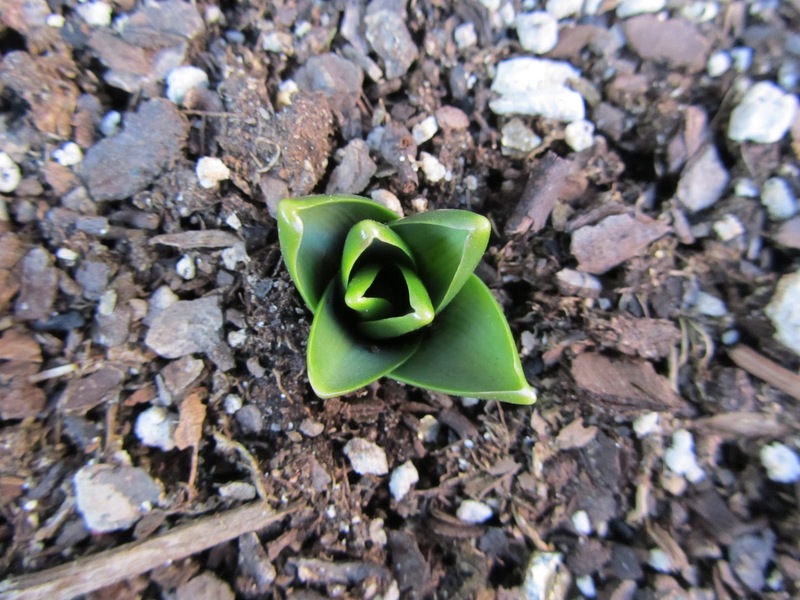 I finally planted the bulbs just days before the first frost. And then, well, what a cold winter we had. I wasn't sure they would survive. But here they are, pushing their green tips through the soil. By Easter,the purple flowers should be in full bloom. When to start the seedlings?? A local urban gardener, who blogs at Gardening in the Boroughs of NYC, recently asked whether we'd started our seedlings yet. Good question! Last year at this time, we had already purchased our tomato seeds and I would say by mid-March, our peat pots were on the window sill and little green shoots were sprouting. Not this year. We are waiting for two reasons. First of all, we are renovating our kitchen, so our apartment is a wreck and we have no place to safely grow any plants, let alone tender veggies. But we are also waiting until April because we want to start the seedlings closer to when we will put them in their outdoor pots, in late May. Last year, we found that starting earlier didn't make the plants grow better or stronger. In fact, they were indoors for too long and became long and spindly - not fat and stout. What about you? When are you starting your plants? When do you put them outdoors? With New York’s freezing weather giving way to milder temperatures, I can’t help but begin to look forward to spring. For my family (which includes my husband Mitch and my cat Minnie) that means plotting our urban garden planting strategy. Our most important decisions include picking out the heirloom tomato varieties we’ll grow from seed and deciding what other veggies to include this year, our sixth season. This is always such an exciting time: the possibilities are endless; the potential pain still hypothetical. I can believe that instead of withering heat in July and August, the weather will be just hot and sunny enough to spur a bumper crop. I can believe that the high winds that whip our 20th floor Manhattan terrace, often knocking over our tomato plants and snapping limbs heavy with ripening fruit, will be calmed. I can believe that this year, I’ll find the perfect cucumber plants to grow in pots. (Last year, the variety of choice punked out on me, despite initially healthy vines.) And I can believe that the aphids that attacked my lettuce late last season will not be back. Of course, just getting the crops started is quite a chore. There’s soil, peat pots and fertilizer to buy. There are trips to make to Home Depot and other local gardening supply stores. We need to test our automated watering system to make sure all the parts survived the winter. If not, it’s replacement time. And, we’ll need to decide whether we’ll add new crops (carrots? beets? catnip?) or stick with the tried and true. Preparation starts now. After all, we must be ready in April to get our tomato, basil and pepper seedlings on their way so we can drop them into pots outdoor by mid-May. Yes, there’s much to do, but this is the kind of work one can never tire of. Unlike that office job, work in the garden provides edible results. Now, that’s what I call rewarding! So, urban gardeners…what plans are you making for spring? What new crops will you plant? And do you predict that this growing season will be especially productive?